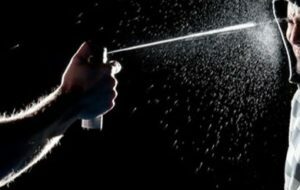 LOS ANGELES – Concerned about the use of pepper spray in Los Angeles County juvenile halls and camps, the Los Angeles County Board of Supervisors Tuesday proposed more training, more cameras and more mental health resources, while juvenile justice advocates called for a outright ban. A report by the Office of Inspector General found that some probation staffers use oleoresin capsicum spray, more commonly known as pepper spray, as a threat or first line of defense, even though department policy dictates its use as a last resort when youth are physically aggressive. The threat of use sometimes gets young people to comply with staff orders, but at other times, threats seemed to unnecessarily escalate situations, based on video reviewed by the OIG. The OIG also reported that staff sometimes failed to decontaminate kids after using the chemical spray, which when sprayed in the eyes brings tears, pain and even temporary blindness. The report mentioned one child with a mental health condition who was sprayed in the groin and buttocks when he was found trying to hurt himself. After being sprayed, he was left in a room without running water for about 20 minutes before staff returned to help him. Policy prohibits using the spray on youth taking psychotropic medication or who have asthma or are pregnant. Public Defender Ricardo Garcia said the use of pepper spray is excessive, out-of-policy and amounts to child abuse. “I believe the only solution in this situation is to ban the use of pepper spray in our facilities,” Garcia told the board. The December request for an OIG review was prompted by media reports, including a nine-month investigation by NBC4 finding the use of pepper spray had more than doubled from 2015-17. The department’s own numbers show the use of pepper spray was up roughly 200 percent at Los Padrinos and Barry J. Nidorf juvenile halls and more than 330 percent at Central Juvenile Hall. However, probation officials reported that usage was down 20 percent in 2018 as compared with 2017 and said the majority of pepper spray use was in line with policy. Chief Deputy Probation Officer Sheila Mitchell, who oversees juvenile probation, said only 36 percent of staffers used OC spray and of those, nearly half were employees who had worked for the department for less than two years and another 30 percent had more than 10 years on duty. That points to the need for more training of new staffers around de-escalating potentially violent situations, as well as the need to change embedded cultural attitudes. Mitchell ran Santa Clara’s Probation Department before coming to Los Angeles. “When I was chief of Santa Clara County, we never used it,” Mitchell told the board, though she stressed the need for additional training rather than proposing a pepper spray ban. Its use is allowed in all three Los Angeles County juvenile halls and two juvenile camps, Camp Ellison Onizuka and Camp Ronald McNair, although 35 states prohibit its use on juveniles, as do San Francisco, Santa Clara, Santa Cruz and Marin counties, according to the OIG report. Probation Chief Terri McDonald, speaking outside the meeting room, told City News Service that Santa Clara County had the advantage of updated juvenile facilities. The department is continuing to close juvenile facilities as it focuses on diversion programs, which has increased the concentration of “high needs, high risk” children among the population of roughly 900 in the halls and seven camps. Supervisor Kathryn Barger said that mirrored issues in the county’s jail system. “All roads lead to mental health, whether it be in the jails or our juvenile halls,” she said. Barger and Supervisor Janice Hahn also emphasized the safety concerns of front-line probation employees. “It’s almost like they feel like they’re being set up for failure,” Barger said, urging more training. Department numbers show youth-on-youth assaults were up 66 percent and youth-on-staff assaults were up 58 percent from 2016-17, though Mitchell said those numbers have since dropped. Probation officers told the OIG they lacked effective policies and training to de-escalate tense situations without using OC spray. Some also called for more supervisory staff. The OIG recommended more cameras, more reporting and more staff training. The department installed 460 cameras at Central Juvenile Hall, where the highest number of assaults have occurred, and the department has requested another $30 million-plus for additional cameras at other facilities. Supervisor Mark Ridley-Thomas, who had called for the OIG review, proposed a special hearing on the issue by the CEO’s Probation Reform and Implementation Team and recommended that the Probation Department develop an implementation plan for the OIG’s recommendations. He also asked the OIG to update data on pepper spray use and report back in 30 days. “The need for reform, investigation and oversight has never been as vital as it is now,” Ridley-Thomas said. 15 comments for "L.A. County debates how to limit use of pepper spray in juvenile halls, camps"
It’s like eating hot peppers… with your eyes. Beats getting beat up or worse. I had a friend that used pepper spray on an ex-boyfriend, and he said he liked it. Sometimes pepper spray doesn’t work. It definately stops you from seeing who you are trying to attack. You would have to be on Crack or pcp to like it. I guess some marines can use it like binaca. But for the most part, it hurts the attacker. Let’s put the LA County Board of supervisors in these juvenile centers for a week without guards. Let’s have them be security for a week and see how they fair. It’s funny people have opinions who never worked in our facilities. We have the most violent youth in the country, the majority are gang members people. I have worked in the halls and camps. I have a huge compassionate heart, however talking and de escalation only goes so far. When you have a 6’5 youth yes youth who is in your face, and your cornered, you better believe me I’m using pepper spray,I’m going home to my family. So please people stop having opinions when you don’t have a clue. How about parents raising these kids the right way so that they don’t end up in a juvenile facility….. maybe if the parents sprayed em with pepper spray every time they were acting stupid then it wouldn’t get this far. What did the staff do, before, there was pepper spray? @Dauntless – I believe they used billy clubs before pepper spray. The real question is how do you control juveniles that have never had to control their own behavior without ‘over-controlling’. With ceiling sprinklers that spray pepperspray. Cut out the middle man and avoid looking overcontrolling. When the aggressive youth finally settles down, the sprinklers will spray water and a door will open up next to the sprinklers and drop down some juice and cookies. @Alby – Brilliant, just brilliant. I believe your idea would work. As great as it sounds, sometimes you got to beat the [removed] out of a [removed] kid that think he’s bigger than you. And when I mean beating up a kid, I don’t mean slapping a kid around for not taking out the garbage or getting c’s in school or verbally challenging me. I’m talking about a 16-20 year old kid that is around my same size and giving the implication that he is about to assault me or already has done so. @tspark How do you control juveniles? My mother used her voice. I can still hear it 20 years after she passed. She hasn’t aged a bit. A lot of guys I ran around with when I was a young’un got into trouble but I managed to navigate the 60s and 70s without a night in jail or worse. Thanks to Mom’s constant nagging when I was a teenage. However, I don’t recommend it. It’s annoying. There must be another way that works as well. I coulda done well with financial rewards now that I think about it. I was in my 30s when I learned that integrity works. It makes life so much easier and satisfying. And, it makes possible the things I’ve gone after in life with a lot less fuss. Maybe that’s why I find trump and parris so unacceptable among many others. I’m not perfect, but, geez those guys lie when the truth would do. That’s why they have to go around the rules and laws to force outcomes. Funny how they both accumulate like-minded liars and corrupt people around them. Trump got what he wanted…the presidency but looks and acts like the most unhappy, miserable and angry person alive. Parris is another story who is so full of himself that he was obsessed with someone like Mayor Ledford who is a gentleman and not a petty loud mouth. The universe will eventually ‘reward’ them before they’re gone. It won’t be pretty.